These are now sold out from Italy. These beautiful pens are now no longer in production sadly. This pen is lightly used and as close to new as possible, but it has been inked. The pen is true oversized pen. 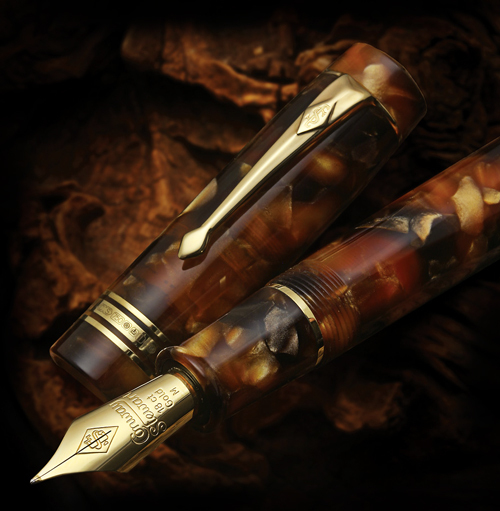 It really shows off the Celluloid on the large body of the pen. It has Rose gold trim and a #8 modern flex nib. Pen aficionados will appreciate the superb writing characteristics from the combination of a large (No. 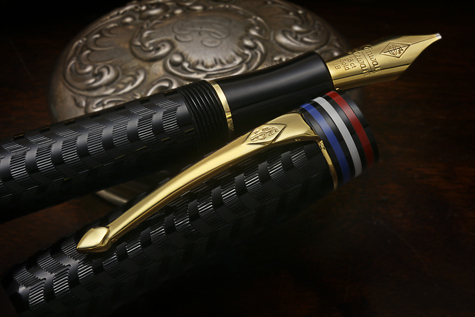 8 size) ‘Magic Flex’ 18K solid gold nib with rose gold plating, and an innovative ebonite feed that flexes to provide superb ink flow. Everything about this design enables you to vary the line width by changing the amount of pressure on the nib as you write. Be careful not to push too hard, as you can bend this flexible nib.